Analyze your trades and learn from your mistakes. 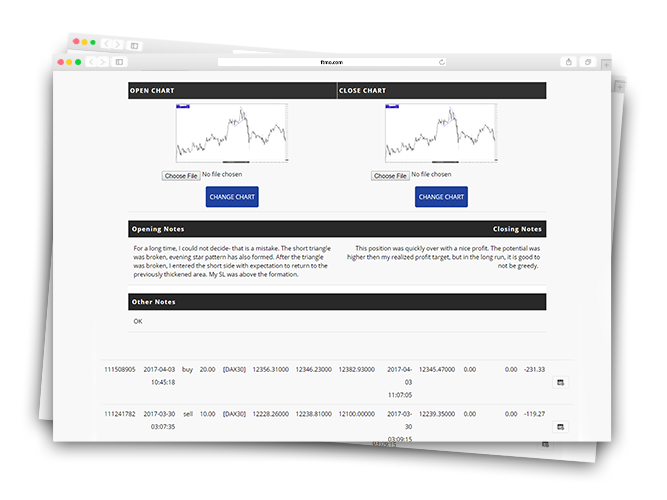 Keeping trading results is not one of the favorite activities of most traders, but with our Trading Journal it is easy. All trades are stored in the journal automatically, you only have to write down your thoughts and feelings about the trades. Over time, you will discover a lot of interesting information to help you eliminate future trading mistakes. In addition to comments, you can assign screenshots for both entry and exit of every single trade. With retrospective analysis, you will experience every trade repeatedly. You will not repeat the same mistakes anymore and you will move your trading to a whole new level. Why to use the Trading Journal? What our traders say about the Trading Journal?